This switch is designed and developed in-house. 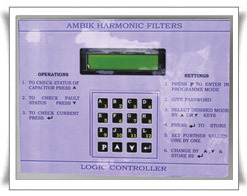 In order to switch capacitor banks in Manual mode, it is necessary to wire up the panels with multiple auxiliary contactors, push-buttons, indicating lamps, timers, etc. The functionality of all the sundry switchgear is built into this electronic module. The required controlled wiring is reduced to 1/10th of what is required with conventional wiring set-up. Feedback indications are provided with LEDs on the Electronic Manual Switch to confirm the capacitor step status (ON or OFF). Different versions of this electronic manual switch are available, incorporating fault annunciations, and setting features.